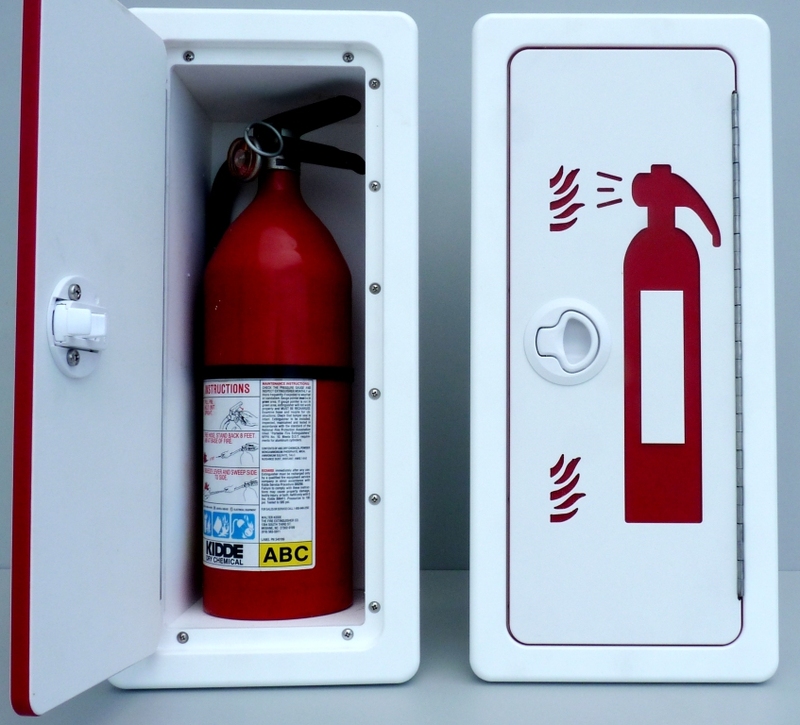 This fire extinguisher storage cabinet is ideal for center console boats -- and is suitable for larger vessels as well. Construction is all King Starboard, with the door panel fabricated from King Starboard Color Core -- so the red graphics are an integral part of the panel, not added on. This model comes standard with a white or black Southco non-locking polycarbonate slam latch, stainless steel piano hinge and all stainless fasteners. 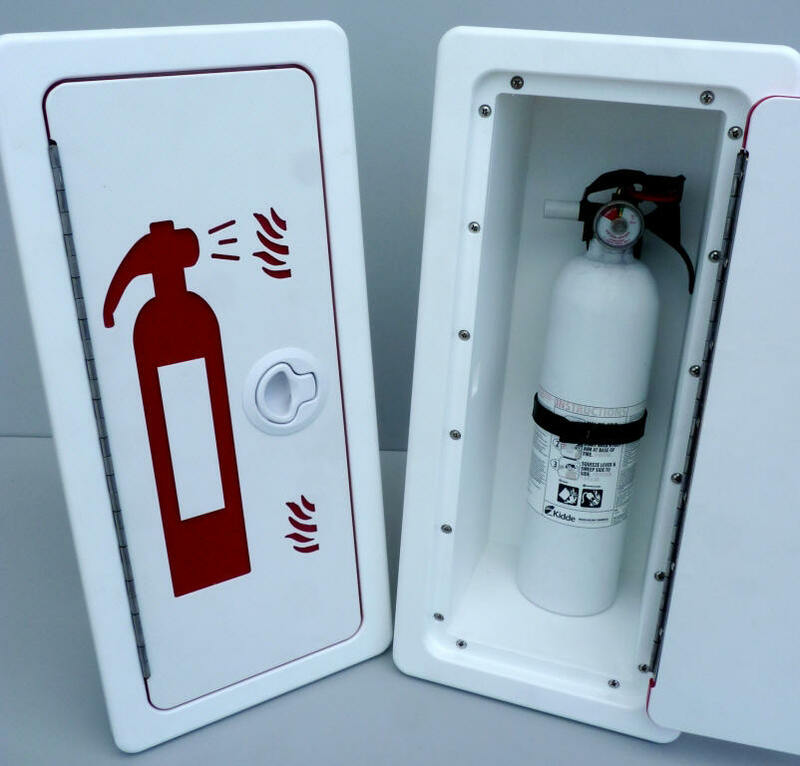 The standard enclosure comes with a door that opens from right-to-left -- but you can specify a left-to-right opening panel at no extra cost. 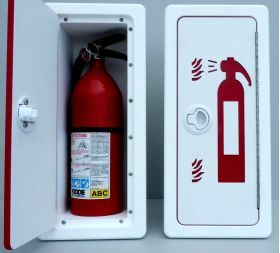 The fire extinguishers shown here are for illustration purposes only, and are not included with this unit. We build our stock design "to order." Please allow 10 - 15 business days from the time you place your order until it ships. Standard White Southco Latch -- No Extra Cost -- This white Southco non-locking polylcarbonate latch is a standard option on our enclosures. It's handsome, tough, and designed for the marine environment. Standard Black Southco Latch --No Extra Cost -- Or choose this black Southco non-locking polycarbonate latch, again as a standard option. Just as with the white version shown above, this latch will stand up to the harsh conditions of a marine environment. 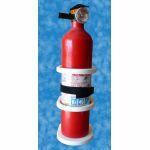 Gasketed Door Panel -- Add $24.95 -- Adding a gasket to your enclosure's door panel won't make it "waterproof." But it will minimize water intrusion from incidental wave-action spray or splashing while washing down your boat, etc. "We have bought several [Buck Woodcraft] glove boxes and the products are great -- but I have to say that the last one we received with the seal on the lid works awesome. 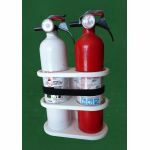 Our customer is raving about how good and water tight it is... As with all the products we receive/order from Buck Woodcraft, the quality is beyond expectations!."